An ongoing problem with understanding issues involving psychoactive plants and chemicals is the lack of reliable, verifiable data about exactly what is being sold and ingested by the tens of millions of people in the United States who choose to take scheduled substances. Testing is tightly controlled and the DEA does not allow quantitative testing for anonymously submitted samples. Often, state and federal police are the only source of testing, and they virtually never publish their collected data to the public. The DEA probably conducts the largest number of analyses of street drugs, yet their publicly funded efforts are secret, and Freedom of Information Requests are denied. This collection of blotter with analytical results is from July 1987 and represents varieties of blotter seized from the late 1970s until early 1987. Unfortunately, the authors of the piece do not include any information about what analytical methods were used to produce the results, and the identifications come from a number of unidentified labs. The blotter images are low quality because the DEA's Microgram in the 1980s was published as black-and-white, photo-copied pages. We are continuing to seek additional documentation on other analyses and working to get more reliable, verifiable information about the contents of products sold as LSD in the underground markets. The attached blotter index is published as a reference guide and for information purposes only. All designs shown have been submitted to and examined by DEA's Special Testing and Research Laboratory. The first column in the index is an arbitrary number used to identify each LSD blotter type. The second column is a black and white photocopy of the printed designs available in our laboratory's reference collection. The third column contains a name given the design, the active ingredient and the quantitation, plus the year(s) the design has been encountered. The "%" indicates the enlargement or reduction used during the reproduction process. Three sizes are used: 65%, 101%, and 154%. Where an asterisk appears the chemical analysis was done by another agency and no quantitation is available. The fourth and final column lists the states and/or countries in which this particular design has been seen by the Special Testing and Research Laboratory. This does not mean that the design has been seen in only those areas! The images on LSD "blotter papers" can be made by a number of different processes. They have appeared as printed, photocopied, rubber stamped, embossed and hand-drawn images. 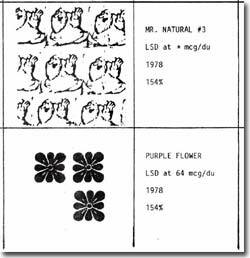 However, LSD "blotter paper" designs are generally printed in color inks by one of the numerous printing shops found across the United States. The printer in most cases does not know that the material will be impregnated with LSD at a future time. Paper treated with LSD swells and will likely jam a printing press. Also commercial printing techniques are quite a waste of paper. The clandestine manufacturer would not want his valuable LSD trashed from printing press adjustments. The LSD tartrate is dissolved in a solvent such as methanol or ethanol in a shallow pan. The printed sheet is dipped into the solution and then hung up to dry. The printing inks are generally insoluble in the solvents used. Because of this procedure, the quantitations can vary significantly (i.e. +/- 100% is common). Laboratories that have encountered designs not shown in this index are requested, if possible, to forward samples to the Special Testing and Research Laboratory for inclusion in its reference collection. When forwarding such samples, please include date, place, and amount collected. THIS INDEX IS FOR REFERENCE ONLY. THE INDEXERS HAVE ATTEMPTED TO ENSURE THAT THE DATA IS CORRECT. HOWEVER, WHEN REPORTING THE WORK OF OTHERS, ALL POSSIBLE ERRORS CANNOT BE CHECKED. PLEASE USE THIS INDEX AS A GUIDE ONLY.